Foam roller exercises are a great way to improve core strength and stability. This very inexpensive tool can really add to stability of the lower abdominals, the obliques, and the hips. The best part about it is that the possiblities for exercises are endless, only limited by your imagination. Read on to learn some of the exercises I use with my patients to improve their core strength and stability. The basic foam roller exercise begins with simply laying on the foam roll. 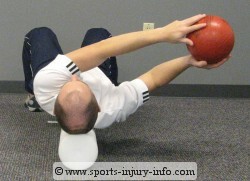 Make sure that your entire spine, including your head, is supported by the foam roll. Place your feet flat on the ground, starting out with them a few inches apart. The closer together your feet are, the harder it will be for you to balance on the foam roller. As you get stronger and the exercises get easier, then you can move your feet closer together. As you balance on the foam roll, think about your lower abdominal muscles and contracting them while you balance. Us the drawing in manuever to stabilize your pelvis. Once you can comfortably balance on the roller without too much wobbling, try moving your feet closer together. Once you can easily balance with your feet together, you are ready to move on to more challenging exercises. In order to further challenge your lower abdominal muscles, you need to perform some movements with your upper or lower body. This changes your center of gravity, and forces your abs and hips to react to the change, and work harder to stabilize you. Arm movements are the first progression with foam roller exercises. They are simple to do, but make it much harder to balance. Start with both arms extended at your sides. Then move your left arm over your head. Now, alternate your arm positions, moving your left arm back to your side, and your right overhead. Remember to concentrate on your lower abs, and to keep the movements slow and controlled. Start off althernating movements 5 times, rest, and repeat. As you get more balanced, add more repetitions. Leg extensions on the foam roller are more challenging than the arm reaches. For one, your feet provide your two points of contact with the ground. When you remove one of them, it really challenges your abdominal muscles to keep you balanced. The second reason they are more challenging is because in order to extend your leg, your lower abdominals not only have to keep you balanced, but they have to stabilize your pelvis as you move your leg. Don't start leg extensions until after you master the arm extensions. Once you are ready, start by really drawing in your lower abdominals. Then slowly extend your right leg until your knee is straight. Hold for a couple seconds, and then return to the ground. Repeat on the left side. Count that as one repetition. Try 5 extensions in a row, rest, and repeat 2-3 sets. As you get more balanced, add more repetions. Medicine balls, or dumbell weights are a great way to increase the challenge to your low abs while on the foam roller. 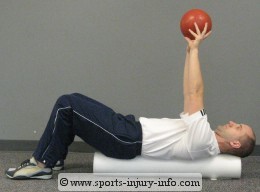 You can perform the arm reaches with both arms overhead and holding a medicine ball. Reach overhead, and then touch the ball to your thighs, and repeat. The weight of the ball challenges your abs even more to keep you balanced. You can also reach side to side with the medicine ball. This is a completely different motion, and will challenge different muscles. It is especially good for the obliques. Foam roller exercises are great at improving core stability, and are an easy additon to any ab training program. The exercises above are presented in order from easiest to hardest, but they are only just a few of the many different ways you can use a foam roller to improve your core strength. Foam rollers are an inexpensive tool that you can use to improve core strength.